Still pondering the reason why Apollo and Thalia would be depicted on the same coin the ghost in the Hall of Remembrances gave her, she entered the Lemurian Mouseion in the City of Ladies. Entering between huge columns, she thought of the many museums she had visited in her life, all with columns, within and without: Metropolitan Museum of Art and the Cloisters in New York City, the University of Pennsylvania Museum in Philadelphia, the Carnegie Museum in Pittsburgh, PA., the British Museum, etc. She moved into the coolness of the House of Muse and was intrigued by the richly detailed mosaic floor, which the sign said was Roman and exhibiting the nine Muses. And here was a sarcophagus, the “Muses Sarcophagus” representing the nine Muses and their attributes. Made of marble in the first half of the second century AD, it had been seized by Napoleon and then exchanged in 1815. What does that mean? She wondered which one was her adopted namesake. There’s Thalia or Thaleia, according to the sign, holding the comic mask—second from the left. Funny, how it all developed. Years ago she had come across a medium-sized box turtle while both were walking in the Ozark woods. This turtle didn’t draw in its head or extremities like most she had come across. Its head stayed out and slowly looked up at her eyes. Whoa! What is this? Not afraid and not looking at my feet, but directly into my eyes. And what beautiful eyes it has—soft and warm. How can a turtle have warm eyes? They’re cold-blooded reptiles. She reached down and slowly picked up the turtle who kept looking at her. For some reason, unknown to her consciously, the name “Thalia” came to mind, so that’s what she called the sweet turtle. She built Thalia a three-level habitat and kept Thalia for a number of years. Remembering Thalia-turtle, she adopted the nickname at various times, liking the sound of it. Previously, she had known Thalia was one of the Greek Muses but didn’t know anything beyond that. She moved around the room, reading about each of the Muses. Fascinating! Where’s Thalia? Oh, here she is. Thalia is Latin whereas Thaleia is Greek. What a lovely statue. Maybe I can get a picture of this and make a collage from it. This is from the Vatican Museum in Rome from the second century C.E. And this one is from the Heritage Museum in St. Petersburg, a Roman copy of the original from the second century AD earlier in Greek. Hmmm, some say C.E. and others say A.D. Wonder what’s the difference? Let’s see what this says: she was the muse of pastoral poetry and comedy and is usually seen with a shepherd’s crook and a mask of comedy. She was either one of the nine Muses (the eighth daughter of Zeus and Mnemosyne) or one of the three Graces born of Zeus and Euryrome, daughter of Oceanus. Some even speculate they are one and the same. Ah! Here it is—Thaleia becomes mother of the Corybentes (or Korybentes) by Apollo. That’s why they are together on the coin. She reached into her pocket for the coin, brought it out and moved it back and forth so it caught the light, and from one side to the other. Then she looked back to the caption which stated there had been a coin made, a denarius, with the head of Apollo and the reverse had Thalia, Muse of Comedy, holding an actor’s mask. This was a rare depiction of a Muse on a coin. Wow! And now I have one. It’s beautiful! How did that ghost have one? And a real one at that? I’ll have to go back to the Hall of Remembrances and get his story. She held onto it, looking at it occasionally as she continued around the room, looking at statues and reading the information. She moved to the center of the circular room where there was an elaborate, large urn with a sign saying anyone making an offering or a hymn to the Muses, or of one in particular receives the honor-offering back three-fold. There was some blank notepaper and pencils there if anyone needed it. Quite a few folded papers were in the urn along with some coins and paper money, what looked to be a necklace and even a ring. A lovely silk scarf was half in and half out of the urn. A few pages had obviously been prepared at home and brought here since the paper was decorative. And someone placed some fresh flowers in an ivy wreath. A pretty, lacy embroidered handkerchief peeked out of the pile of offerings. What can I offer at this altar? I could do a quick poem, or maybe tell a story about who my muse might be… but wait a minute… I think Thalia is my muse. What could I leave for her? She suddenly realized her fingers had been unconsciously playing with the coin she had returned to her pocket for safe keeping. She brought it out and looked at the smooth edges where many fingers had worn them down over time. I don’t need the coin to remember to go back to the Hall of Remembrances. I love it, and it feels right to be touching it, but really… I guess I’ve had Thalia as my muse for many years without realizing it. What better place could there be, for this coin? But not as an offering, but a gift in gratitude. My life is already flourishing and flowering (what they say is the meaning of the name ‘Thalia’). Perhaps that has been my muse’s influence already combined with Grace from beyond the realm of muses. What more do I need? My life overflows with love and support and gratitude. The choosing of the name Thalia years ago for the turtle was either from the deep unconscious or the higher consciousness. In either case, it has worked. My muse found me. She lovingly rubbed the coin and looked at both sides to engrave the images into her mind’s eye for future reference. 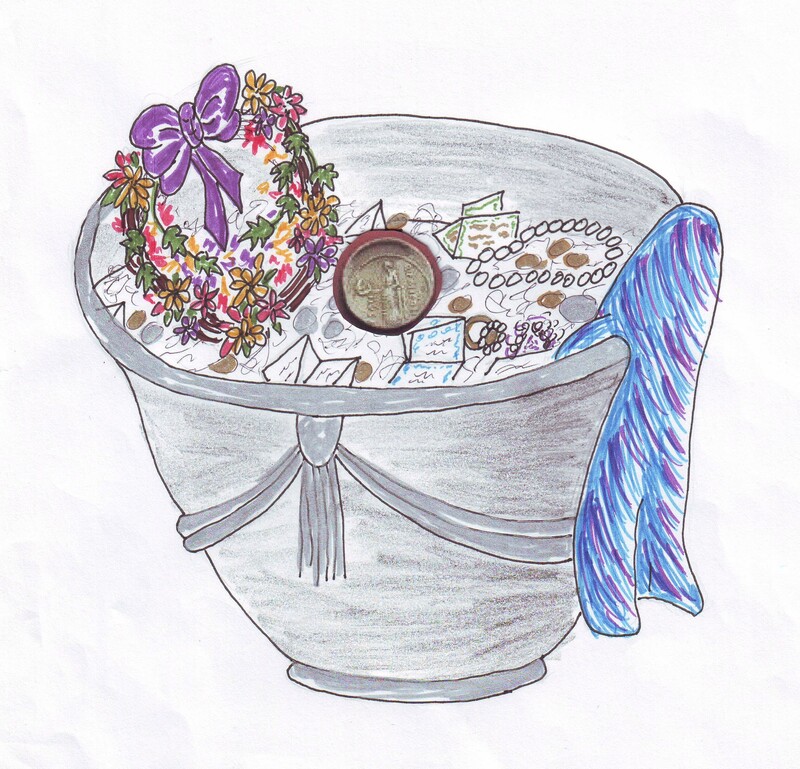 Then gently and reverently placed the coin on top of all the other offerings in the urn with a reverent Thank you. She then turned and walked outside. When I finish this walking tour and return home, I think I’ll make a collage card using pictures of these statues and the sarcophagus and, maybe even a turtle, to represent this part of the tour. And if I answer the Soul College questions, I will learn even more about this aspect of myself that is Thalia. 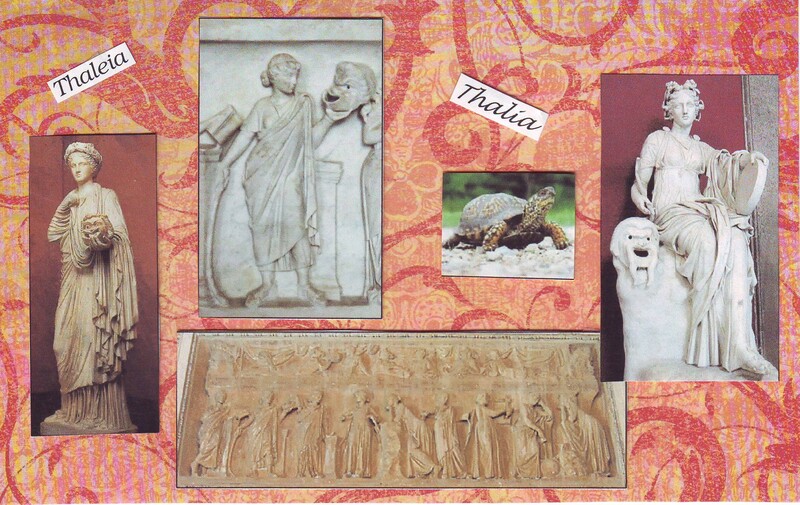 As she walked, she mulled over how she might arrange the pictures on her Thalia/Thaleia collage card. Maybe I’ll even post the completed card and related answers on my blog when I get it finished. What an adventure this walking tour has been. And there’s still more to go. Hope my feet hold out. I wonder how far it is to the Labyrinth and the Tholos. This older body and weary feet need a rest.